• On 13 September 2018, MAN started the vehicles’ practical testing phase as part of a project partnership with Austrian business consortium CNL. • At the kick-off event at the MAN plant in Steyr, representatives from participating logistics companies received nine test vehicles from MAN Truck & Bus Chief Executive Officer Joachim Drees and Dr Ulrich Dilling, the Executive Board member for Production and Logistics. • Council for Sustainable Logistics member companies will test out fully electric 26-tonne MAN TGMs in regular logistics operations over several months. The first nine MAN electric trucks were handed over to member companies of Austria’s Council for Sustainable Logistics (CNL) on 13 September at MAN Truck & Bus’ plant in Steyr, Austria. Quite aptly, the event saw this development partnership set off at full throttle – a partnership which, to date, has been unique in the commercial vehicle sector. 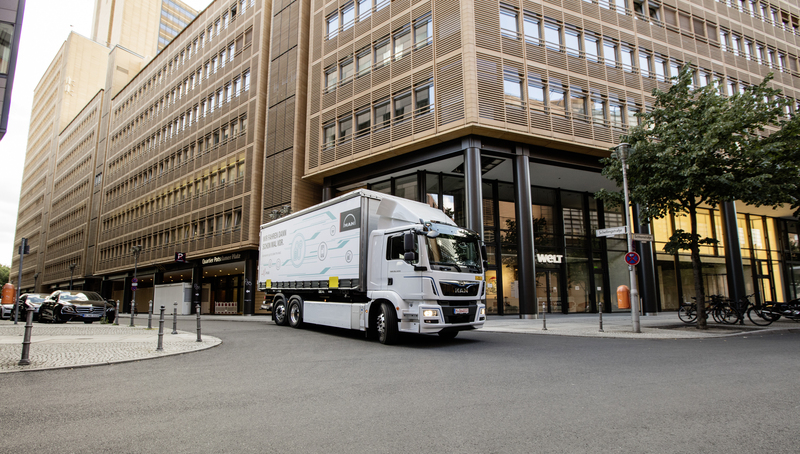 The advantages of fully electric-powered trucks are as clear as day: New solutions for freight transport and logistics are needed, due to increasingly densely populated urban areas with growing traffic and congestion, as well as more restrictive environmental protection laws and the rising tide of public consciousness in favour of strengthening sustainability in all areas. 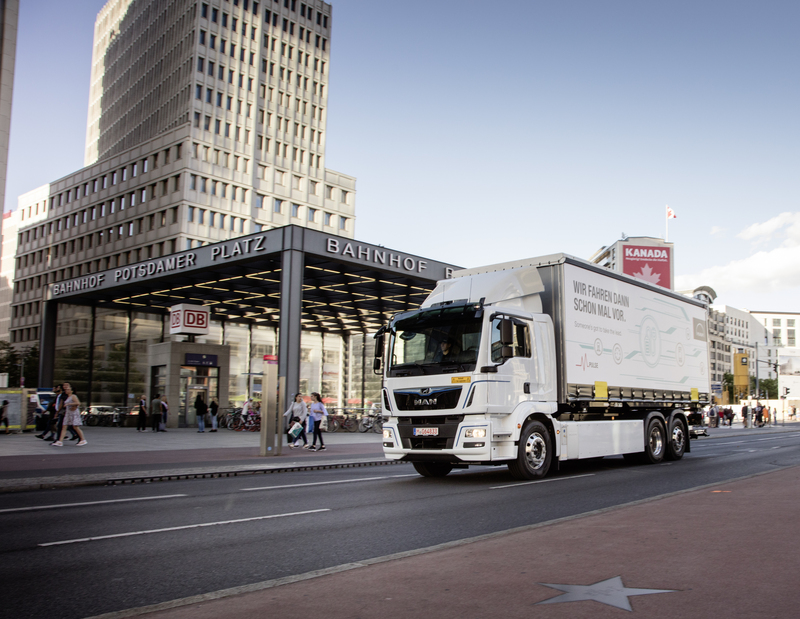 It is on short-haul routes in urban traffic and distribution transport contexts that electrified commercial vehicles can be the solution to help reduce CO2 and nitrogen oxide emissions to a minimum – or to avoid them entirely on a local scale. In these circumstances, they run incredibly quietly, making them useful for night-time and early-morning deliveries. The new electric vehicles include four 6x2 chassis with refrigeration units and liftgates for use at HOFER, METRO, REWE and SPAR; three 6x2 chassis with swap bodies for haulage firms Gebrüder Weiss, Quehenberger Logistics and Schachinger Logistik; one 6x2 chassis for beverage transport at the Stieglbrauerei; and one 4x2 semitrailer tractor for plant logistics applications at Magna Steyr. As a result, the vehicles form a representative cross-section of the most common distribution transport tasks in urban logistics. The MAN electric trucks’ chassis are based on the MAN TGM. The electric motor, located in the centre of the frame, outputs 264 kW and delivers up to 3,100 Nm of torque to the drive wheels without a manually operated gearbox. The lithium-ion batteries are fitted beneath the cab on the side of the frame. In the 26-tonne solo chassis version (MAN TGM 6X2-4 LL), a total of 12 batteries are installed; these allow for a range of up to 200 kilometres (more than 120 miles), depending on the body configuration, type of use and driving profile. Up to eight battery packs can be used in the four-wheel semitrailer tractor version (MAN TGM 4X2 LL) – consequently, the range can reach as high as 130 kilometres (around 80 miles), depending on the usage profile and type of semitrailer. All the vehicles also have air suspension on the front and rear axles, guaranteeing adaptability to every loading scenario in urban areas. Comfort-enhancing features and vehicle functions like the air-conditioning system, steering and air compressor are also electric-powered. The same is true for body functions such as the liftgates and cooling units. Brake energy is recovered (what is called “recuperation”): when decelerating the vehicle’s motive energy is converted into electrical energy and fed back into the battery. A display in the cockpit informs the driver about the batteries’ current energy level. It is possible to charge the batteries with either AC (22 or 44 kW) or DC (150 kW). The charging interfaces are CCS Standard Type 2-compliant. Sensible and efficient vehicle routing and usage planning is crucial for the choice of charging infrastructure. As far as MAN is concerned, it was a logical step as part of the vehicles’ development to hand over the eTGMs to the CNL partner companies for customer testing purposes. The aim is to acquire a wide array of experience, along with new ideas for continuous development and optimisation, directly from the customers’ practical day-to-day operations. The holistic approach is also reflected in another building block of the MAN electric vehicle concept. As they navigate the path from “low emissions” to “no emissions”, fleet operators face a range of challenges that go beyond the vehicle itself. To provide them with the best possible support in this regard, MAN Truck & Bus has called upon MAN Transport Solutions, its team of consultants specialising in individual transport solutions that offer maximum cost efficiency. Thanks to their wealth of experience, the qualified consultants can also cover issues relating to infrastructure and energy consumption, as well as maintenance concepts and fleet design. Customers can select whichever components of the range of services they need, as the Transport Solutions specialists provide personalised advice and consultancy. For example, they can use simulation tools to assist them with route planning or with depot design and layout. The consultants can draw on their expertise to issue advice across the full spectrum of possible uses ranging from operation and infrastructure to servicing and maintenance. This includes traffic planning with vehicle scheduling and route planning, management of batteries and charging, analyses and optimization of energy requirements, together with maintenance plans and depot design and training. The joint tests with the member companies of the Council for Sustainable Logistics are part of MAN’s eMobility Road Map, which also includes plans to present a prototype bus version of a battery-electric vehicle (BEV) in late 2018. Its market entry will follow in 2020, with an incremental increase in output over time. The practical tests conducted by the CNL companies, which are now underway, will form the basis for future electric truck projects and the resulting mass production development. In pursuing its eMobility Roadmap, MAN benefits from its position as part of the Volkswagen Group, from the synergies within the Group and from the dynamism of its passenger car division.